Yesterday, I attended the NERCOMP WordPress University SIG, a showcase of what some folks are doing with WordPress. Described reworking Bates College’s web presence to identify and streamline paths that guide people through different stages of connection to the institution. Traditionally, each stage (e.g., applicant, student, alumnus, etc.) was a separate silo. Lots of good, high-level analysis. WordPress allowed Jay to implement a redesigned site with minimal resources, but a robust result. Easy content development for contributing departments. 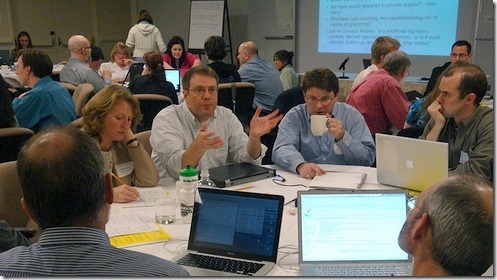 This entry was posted in Posts and tagged NERCOMP, trip report, wordpress on April 9, 2010 by Geoff Duke. I’m now posting my first blog entry using the visual editor. Hurrah! Many thanks to the member who posted the solution, a certain bcodding. I wonder… Confirmed: that’s my colleague, Ben, from down the hall. Quite the coincidence! This entry was posted in Posts and tagged php, troubleshooting, wordpress on September 25, 2008 by Geoff Duke.